The Abstract Syntax Tree (AST) is the base framework for many powerful tools of the Eclipse IDE, including Semantic highlighting, Refactoring, Quick Fix and Quick Assist. The Abstract Syntax Tree maps plain PHP source code in a tree form. This tree is more convenient and reliable to analyze and modify programmatically than text-based source. This part of the article shows how you can use the Abstract Syntax Tree for extending Eclipse PHP Development Tools (PDT) for your applications. This article is based on the "Abstract Syntax Tree" (JDT) By Thomas Kuhn and Olivier Thomann. The AST is comparable to the DOM tree model of an XML file. Just like with DOM, the AST allows you to modify the tree model and reflects these modifications in the PHP source code. Removal of unnecessary declaration. If a variable is declared and initialized, only to be overridden by another assignment later on, the first declaration of the variable is an unnecessary declaration. Move of declaration. If a variable is declared, and not immediately referenced within the following statement, this variable declaration has to be moved. The correct place for the declaration is the line before it is first referenced. Move of declaration of a variable that is referred to from within different blocks. This is a subcase of case 2. Imagine that a variable is used in both a try- and a catch clause. Here the declaration cannot be moved right before the first reference in the try-clause, since then it would not be declared in the catch-clause. Our application has to deal with that and has to move the declaration to the best possible place, which would be here one line above the try-clause. In Appendix A, Code Fragments for Example Application Cases code snippets to each of these cases are provided. You can import the example application into your workspace  or install the plug-in using the Eclipse Update Manager . Parse: The source code described at 1 is parsed. All you need for this step is provided by the class org.eclipse.jdt.core.dom.ASTParser. See the section called “Parsing source code”. The Abstract Syntax Tree is the result of step 2. It is a tree model that entirely represents the source you provided in step 1. If requested, the parser also computes and includes additional symbol resolved information called "bindings". By directly modifying the AST. By noting the modifications in a separate protocol. This protocol is handled by an instance of ASTRewrite. See more in the section called “How to Apply Changes”. Writing changes back: If changes have been made, they need to be applied to the source code that was provided by 1. This is described in detail in the section called “Write it down”. As mentioned, the Abstract Syntax Tree is the way that Eclipse looks at your source code: every PHP source file is entirely represented as tree of AST nodes. These nodes are all subclasses of ASTNode. Every subclass is specialized for an element of the PHP Programming Language. E.g. there are nodes for method declarations ( MethodDeclaration), class declaration (ClassDeclaration), assignments and so on. One very frequently used node is Identifier. An Identifier is any string of PHP source that is not a keyword or a scalar Scalar For example, in $i = 6 + $j;, $i and $j are represented by Identifier. All AST-relevant classes are located in the package org.eclipse.php.core.dom of the org.eclipse.php.core plug-in. To discover how code is represented as AST, the AST Viewer plug-in  is a big help: Once installed you can simply mark source code in the editor and let it be displayed in a tree form in the AST Viewer view. Entire source file: The parser expects the source either as a pointer to a PHP file (which means as an ISourceModule, see the section called “PHP Model”) or as char. The PHP Model is a whole different story. It is out of scope of this article to dive deep into its details within. The parts looked at will be the ones which intersect with the AST. The motivation to discuss it here is, to use it as an entry point to build an Abstract Syntax Tree of a source file. Remember, the ICompilationUnit is one of the possible parameters for the AST parser. IScriptProject: Is the node of the PHP Model and represents a PHP Project. It contains IProjectFragment as child nodes. IProjectFragment: Represents a project fragment, and maps the contents to an underlying resource which is either a folder, JAR, or ZIP file. IScriptFolder: Represents a folder containing script files inside. ISourceModule: Represents a PHP source file. IType: Represents a class or interface in a source file. In contrast to the AST, these nodes are lightweight handles. It costs much less to rebuild a portion of the PHP Model than to rebuild an AST. That is also one reason why the PHP Model is not only defined down to the level of ISourceModule. There are many cases where complete information, like that provided by the AST, is not needed. One example is the Outline view: this view does not need to know the contents of a method body. It is more important that it can be rebuilt fast, to keep in sync with its source code. There are different ways to get an ISourceModule. The example applications are launched as actions from the package tree view. This is quite convenient: only add an objectContribution extension to the point org.eclipse.ui.popupMenus. By choosing org.eclipse.dltk.core.ISourceModule as objectClass, the action will be only displayed in the context menu of a compilation unit. Have a look at the example application's plugin.xml. The compilation unit then can be retrieved from the ISelection, that is passed to the action's delegate (in the example, this is ASTArticleActionDelegate). Even a simple "Hello world" program results in a quite complex tree. How does one get the FunctionInvocation of that println("Hello World")? Scanning all the levels is a possible, but not very convenient. There is a better solution: every ASTNode allows querying for a child node by using a visitor (visitor pattern ). Have a look at AbstractVisitor. There you'll find for every subclass of ASTNode two methods, one called visit(), the other called endVisit(). Further, the ASTVisitor declares these two methods: preVisit(ASTNode node) and postVisit(ASTNode node). If false is returned from visit(), the subtree of the visited node will not be considered. This is to ignore parts of the AST. static methods: every node offers methods to access its properties: e.g. getName(), etc. generic method: ask for a property value using the getStructuralProperty(StructuralPropertyDescriptor property) method. 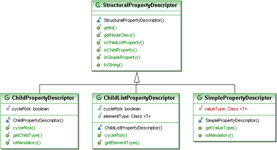 Every AST subclass defines a set of StructuralPropertyDescriptors, one for every structural property. 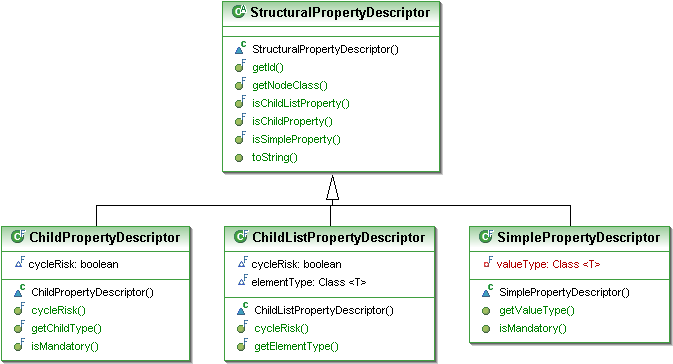 The StructuralPropertyDescriptor can be accessed directly on the class to which they belong: e.g. FunctionDeclaration.NAME_PROPERTY. A list of all available StructuralPropertyDescriptors of a node can be retrieved by calling the method structuralPropertiesForType() on any instance of ASTNode. 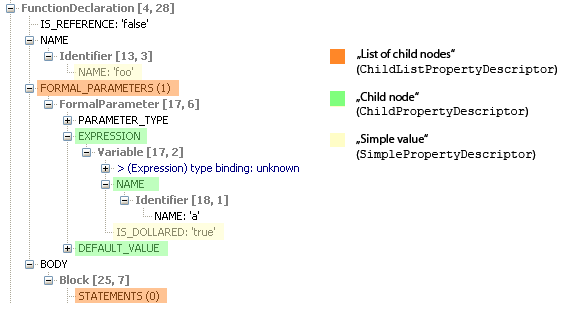 The structural properties are grouped into three different kinds: properties that hold simple values, properties which contain a single child AST node and properties which contain a list of child AST nodes. The AST, as far as we know it, is just a tree-form representation of source code. Every element of the source code is mapped to a node or a subtree. Looking at a reference to a variable, let's say $i, is represented by an instance of Identifier with "i" as IDENTIFIER property-value. Bindings go one step further: they provide extended resolved information for several elements of the AST. About the Identifier above they tell us that it is a reference to a local variable of type int. Various subclasses of ASTNode have binding information. It is retrieved by calling resolveBinding() on these classes. There are cases where more than one binding is available: e.g. the class MethodInvocation returns a binding to the method that is invoked (resolveMethodBinding()). Furthermore a binding to the return type of the method (resolveTypeBinding()). Since evaluating bindings is costly, the binding service has to be explicitly requested at parse time. This is done by passing the relevant ISourceModule to the method ASTParser.createParser() before the source is being parsed. Bindings allow you to comfortably find out to which declaration a reference belongs, as well as to detect whether two elements are references to the same element: if they are, the bindings returned by reference-nodes and declaration-nodes are identical. For example, all Identifiers that represent a reference to a local variable i return the same instance of IVariableBinding from Identifier.resolveBindings(). The declaration node, Identifier.resolveBinding(), returns the same instance of IVariableBinding, too. If there is another usage of a local variable i (within another method or block), another instance of IVariableBinding is returned. Confusions caused by equally named elements are avoided if bindings are used to identify an element (variable, method, type, etc.). This section will show how to modify an AST and how to store these modifications back into PHP source code. New AST nodes may have to be created. New nodes are created by using the class org.eclipse.php.core.dom.AST (here AST it is the name of an actual class. Do not confuse with the abbreviation "AST" used within this article). Have a look at this class: it offers methods to create every AST node type. An instance of AST is created when source code is parsed. This instance can be obtained from every node of the tree by calling the method getAST(). The newly created nodes can only be added to the tree that class AST was retrieved from. Often it is convenient to reuse an existing subtree of an AST and maybe just change some details. 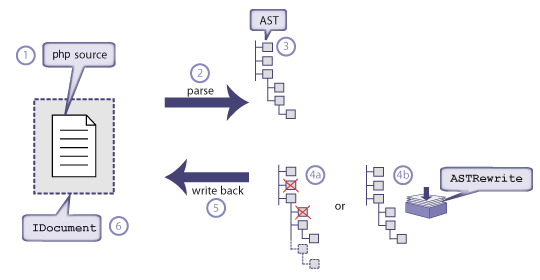 AST nodes cannot be re-parented, once connected to an AST, they cannot be attached to a different place of the tree. Though it is easy to create a copy from a subtree: (Expression) ASTNode.copySubtree(ast, node) . The parameter ast is the target AST. This instance will be used to create the new nodes. That allows copying nodes from another AST (established by another parser run) into the current AST domain. There are two APIs to track modifications on an AST: either you can directly modify the tree or you can make use of a separate protocol, managed by an instance of ASTRewrite. The latter, using the ASTRewrite, is the more sophisticated and preferable way. The changes are noted by an instance of ASTRewrite, the original AST is left untouched. It is possible to create more than one instance of ASTRewrite for the same AST, which means that different change logs can be set up. "Quick Fix" makes use of this API: this is how for every Quick Fix proposal a preview is created. Example 1. Protocolling changes to a AST by using ASTRewrite . To set a simple property value, call set() like shown above. Let us have a look at the second way to change an AST. Instead of tracking the modifications in separate protocols, we directly modify the AST. The only thing that has to done before modifying the first node is to turn on the change recording by calling recordModifications() on the root of the AST, the CompilationUnit. Internally changes are logged to an ASTRewrite as well, but this happens hidden to you. Example 2. Modifying an AST directly. The next section will tell how to write the modifications back into PHP source code. Once you have tracked changes, either by using ASTRewrite or by modifying the tree nodes directly, these changes can be written back into PHP source code. Therefore a TextEdit object has to be created. Here we leave the code related area of the AST, and enter a text based environment. The TextEdit object contains character based modification information. It is part of the org.eclipse.text plug-in. If you used ASTRewrite, ask the ASTRewrite instance for the desired TextEdit object by calling rewriteAST(IDocument, Map). If you changed the tree nodes directly, the TextEdit object is created by calling rewrite(IDocument document, Map options) on CompilationUnit. The first parameter, document, contains the source code that will be modified. The content of this container is the same code that you fed into the ASTParser. The second parameter is a map of options for the source code formatter. To use the default options, pass null. Obtaining an IDocument if you parsed source code from a String is easy: create an object of the class org.eclipse.jface.text.Document and pass the code string as constructor parameter. If you initially parsed an existing PHP source file and would like to store the changes back into this file, things get a little bit more tricky. You should not directly write into this file, since you might not be the only editor that is manipulating this source file. Within Eclipse, PHP editors do not write directly on a file resource, but on a shared working copy instead. Connect a path to the buffer manager. After that call, the document for the file described by path can be obtained. Ask the buffer for the working copy by calling getTextFileBuffer. From the ITextFileBuffer we get the IDocument instance we need. Store changes to the underlying file. Disconnect the path. Do not modify the document after this call. One of the most frustrating part of modifying an AST is the comment handling. The method CompilationUnit#getCommentList() is used to return the list of comments located in the compilation unit in the ascendant order. Unfortunately, this list cannot be modified. This means that even if the AST Rewriter is used to add a comment inside a compilation unit, the new comment would not appear inside the comments' list. The methods Program#getExtendedLength(ASTNode) and Program#getExtendedStartPosition(ASTNode) can be used to retrieve the range of a node that would contains preceding and trailing comments and whitespaces. This article has shown how to use the Eclipse AST for static code analysis and code manipulation issues. It touched the PHP Model, explained Bindings and showed how to store changes made to the AST back into PHP source code. For remarks, questions, etc. enter a comment in the bugzilla entry of this article . Download the Packed Example Project. Use the option "Existing Projects into Workspace" from the "Import" Wizard to add it to your workspace. To install the plug-in, obtain using the Eclipse Update Manager. Update Site: http://earticleast.sourceforge.net/update. PHP Tool Smithing, Extending the Eclipse PHP Development Tools . AST Article bugzilla entry . In the introduction, three typical cases for our example application have been presented (see the section called “Example Application”). Clarifying code before / after code snippets follow to further clarify these cases. Move of a declaration of a variable, that is used within different blocks. 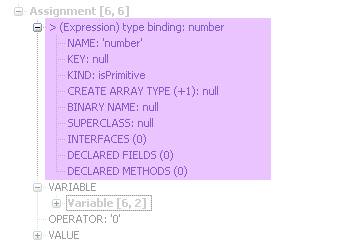 Below the list of all classes of which simple property values can be instance of (in Eclipse version 3.2).